Monrovia – A FrontPageAfrica investigation has found that Liberia’s Minister of Finance and Development Planning Mr. Samuel D. Tweah reportedly spent US$16,000(sixteen thousand United States Dollars) to upgrade his flight from Business to First Class aboard an Emirates Airbus 380 flight out of Accra, Ghana to Beijing, China where he, President George Manneh Weah and more than fifty government officials are currently attending the Forum on China-Africa Relations. President Weah and delegation have reportedly been lobbying Beijing for US$3 billion to fund its ambitious Southeast Coastal Highway. This week, Chinese President Xi Jinping announced a US$60 billion in foreign assistance to Africa’s 50 countries. Business Class fares on Emirates run between $6,000 to $8,000 while First Class fares on Emirates run between $10,000 to $12,000 depending on the time of purchase. Upgrades on either service at departure could run up to US$16,000 for First Class between Accra and Beijing. In comparison, First Class fares from New York to Beijing run close to US$19,000. A copy of the E-Ticket (reference H5FEQB and Booking reference MQSHXF for Ticket No. 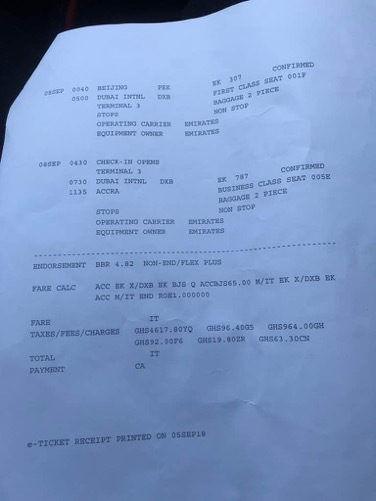 1762654039489 of the minister’s itinerary issued by Worldwide Air Service in Osu, obtained by FrontPageAfrica shows that the minister departed Accra on Monday, August 27, 2018 and arrived in Beijing on Wednesday, August 29, 2018. The minister, according to the E-Ticket in FPA’s possession is due to return on Saturday, September 8, 2018. Under the approved and revised official Travel Ordinance for 2016/2017 policy for officials and employees of the government of Liberia, only the President is allowed to travel First Class. The policy states: “The President shall travel First Class. The Vice President, Chief Justice of the Supreme Court, and the Speaker of the House of Representatives and President Pro-Tempore of the Liberian Senate shall travel by Business Class. If these dignitaries are traveling as State guests and taking their spouses along with them, then their spouses shall also be entitled to travel by First Class and half the applicable per diem rates. With the exception of those listed in Rule 16, all other officials, civil servants, employees and heads of SOEs shall travel by economy class. FrontPageAfrica has not been able to find out what class of flight other officials of government on the delegation, including the president, traveled on to Beijing for the forum but an estimate of the reported 50-member delegation put business class estimates for the ministers at US$12,000 each and US$500 per diem for each day. What is also unclear is whether the minister followed government policy of purchasing tickets from a tax-compliant agency. The law also states that no more than two persons shall constitute a delegation from any Ministry/Agency, State Owned Enterprise (SOE) and Autonomous Agency except for the Foreign Minister (which shall be no more than three) or in cases where expansion of the delegation is explicitly approved by the President in Writing. The Emirates A380 first class include onboard Lounges will feature a sleeker design – with a clean ivory palette, and bronze and wood grain accents. It has a more social seating arrangement and more open areas for mingling, and sink into relaxation with calming LED mood lighting while enjoying a cocktail and a selection of nibbles. It also features major live events with fellow travellers on the 55 inch LCD TV screen – with surround sound. The First Class cabin also offers organic seaweed skincare range from award-winning Irish brand VOYA, available in the onboard Shower Spa. Passengers in the First Class cabin also have the luxury of pampering themselves with Bulgari amenity kits and luxury skincare essentials and Bulgari’s Eau Parfumée au thé noir – the signature woody floral fragrance. The pyjamas have matching slippers, an eye mask and a felt pouch so you can take them home with you – the Microcapsule Technology locks in the moisturiser so you can wash and wear them again. The 7th edition of the FOCAC ran from September 3-4 bringing together China and the 53 African countries with which it has diplomatic relations, excluding Swaziland, plus the African Union. The revelation comes as several of Liberia’s partners have themselves been cutting down on business and first class travels. In March, United Nations Secretary General Ban Ki Moon introduced a new air travel policy for UN employees eradicating high‑ranking officials from flying business class — rather than first class — to help rein in one of the most expensive aspects of the Organization’s budget. After staff costs, travel accounts for one of the largest budget components of the United Nations system, making it one of the largest consumers of travel services among international organizations. From 2012 to 2015, air travel and related expenses totalled $4.01 billion, according to the Joint Inspection Unit report. Standards of accommodation varied between entities, but for most, staff below the D‑2 grade could fly business class on journeys longer than 9 hours. The US government has also eliminated first and business class travel for employees of the United States Aid for International Development. This coming after an audit found that the government agency spent $18.8 million on luxury plane travel between 2009 and 2013.. The revelation also comes in the wake of mounting pressure on Beijing from both the World Bank and the International Monetary Fund(IMF) to halt the pumping of millions into corrupt African nations. A Reuters report this week quoted Chinese officials of dismissing questions about corruption, environmental problems and concerns about a lack of Africans employed in some of China’s projects. The Weah administration which has been trumpeting a pro-poor agenda has come under fire since taking over in January. In his inaugural address in January, the President declared that the most effective way to directly impact the poor, and to narrow the gap between rich and poor, is to ensure that public resources do not end up in the pockets of Government officials. Said President Weah: “I further believe that the overwhelming mandate I received from the Liberian people is a mandate to end corruption in public service. I promise to deliver on this mandate. As officials of Government, It is time to put the interest of our people above our own selfish interests. It is time to be honest with our people. Though corruption is a habit amongst our people, we must end it. We must pay civil servants a living wage, so that corruption is not an excuse for taking what is not theirs. Those who do not refrain from enriching themselves at the expense of the people – the law will take its course. I say today that you will be prosecuted to the full extent of the law. Critics have taken President Weah himself to task over his failure to declare his assets and make them public. As a result several of his own officials have not yet declared their assets. The President himself has come under fire over the construction of several personal projects since taking office in January. President Weah’s 2005 declaration put his overall income per annum at US$335,000.00 on properties in Liberia and the United States. 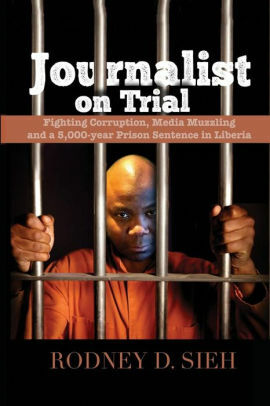 According to the declaration, he earned US$60,000 from his supermarket in Florida, USA; US$250,000 from real estate in the USA and US$25,000 from his real estate in Liberia. President Weah in 2005 declared that his combined assets both in Liberia and the USA were more US$2.8 million. His residence in Florida, USA was said to worth US$1.5 million, while his Supermarket in Miami, Florida was said to worth US$1.2 million. Documents obtained by FrontPageAfrica indicate that the Florida supermarket – Flavors West Indian Supermarket and Restaurant – which is registered in his wife’s name had been inactive. His two residences in Liberia were said to be valued US$250,000, with the one in which he currently resides in the ELWA Rehab Road community in Paynesville being put at US$100,000. The demolished residence on 9th Street in Sinkor, Monrovia was valued in 2005 at US$150,000. He, however, failed to state his bank balances in the declared assets. Several years later, Weah in 2014 won the Senatorial elections and became Senator of Montserrado for three years until his election as President in December 2017, earning a monthly income of somewhere around US$15,000. His total worth as Senator for the three years is estimated to be US$540,000. In recent years, a number of Africa leaders have been singled out with praise for flying economy class. South African President Cyril Ramaphosa was recently spotted aboard an economy-class Safair flight to Durban and Tanzania President John Magufuli was recently featured sitting at the economy section of a plane. 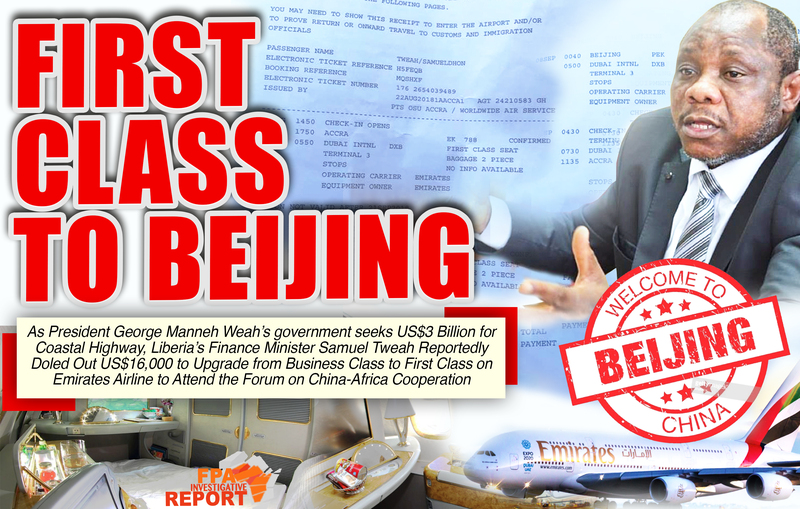 While it is likely the minister had miles, aviation experts say it would require at least ten business class trips from Accra to Beijing to accumulate enough miles to upgrade to First Class without paying a fee. Proclaiming he inherited a broke economy from his predecessor Ellen Johnson-Sirleaf, President Weah in his first annual message in January pledged to cut his own salary by a quarter. “In view of the very rapidly deteriorating situation of the economy, I am informing you today, with immediate effect, that I will reduce my salary and benefits by 25 percent,” Weah said, pledging the savings to a development fund for Liberia. The President added: “The state of the economy that my administration inherited leaves a lot to do and to be decided,” the former international soccer star said in an address apparently aimed at lowering high expectations following his election victory at the end of last year to replace Ellen Johnson Sirleaf. Our economy is broken; our government is broke. Our currency is in free fall; inflation is rising Unemployment is at an unprecedented high and our foreign reserves are at an all-time low”. Critics are finding it ironic that in the midst of abject poverty as proclaimed by the president, his administration continues to undertake extravagant travel spending and massive personal projects.